Dr. Robert Puff, Ph.D. is a clinical psychologist, author, international speaker, and meditation expert who has been counseling individuals, families, nonprofit organizations, and businesses for over twenty years. A contributing writer to Psychology Today, he has authored numerous books, including Reflections on Meditation: A Guide for Beginners, Anger Work: How to Express Your Anger, Still Be Kind, and Meditation for Health and Happiness. He holds a Master’s Degree from Princeton University and a Ph.D. in Clinical Psychology from Fuller. He has taught at Rosemead Graduate School of Psychology and has worked as a staff psychologist at Trenton Psychiatric Hospital and St. Jude’s Medical Hospital, as well as other prestigious institutions. He has been happily married for fifteen years and has two beautiful children. Dr. 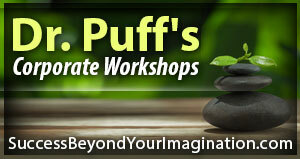 Puff is recognized as one of California’s leading therapists and meditation and mental health management experts. His practice includes adult, child, adolescent, and couples counseling in the Orange County area. His approach to life and to therapy is holistic. He teaches people to let go of negative thinking patterns, manage stress, heal from traumatic experiences, develop spirituality, and to succeed in life beyond expectations. Dr. Puff has given thousands of media interviews, and frequently appears on TV and on radio talk shows. His books are very popular and have been Amazon bestsellers. Additionally, Dr. Puff co-hosts a weekly international Web-TV program called The Holistic Success Show, which can be viewed in over 200 countries. He also hosts The Meditation for Health Podcast, which includes weekly lessons on everything one needs to know about meditation. And, he maintains a blog and a podcast on the topic of Happiness. Discovery of the forgotten self has traditionally been called enlightenment. In these podcasts, Dr. Robert Puff, a respected psychologist and meditation expert, shares his insights on enlightenment, derived from his twenty-five years of personal meditation experience. If you are new to meditation and wonder where your practice is leading, or if you are a long-time meditator trying to make sense out of your new perceptions of life, then these enlightenment books and spiritual podcasts are for you.